This is probably one of the most ridiculous albums you're going to hear. Certainly Richard Cheese has done similar, but he does it for real. With Pat Boone, it was just a one timer. You have to bear in mind he was most notorious for watered-down versions of 1950s R&B and rock and roll (Little Richard was convinced that kids bought Pat Boone 45s to show it to their parents, with their approval, when in fact they were sneaking the Little Richard 45 and playing that instead, behind their parents back). I was obviously not alive in the 1950s, but I'm certain many kids were picked on in school if they admitted to liking Pat Boone as he was considered uncool. 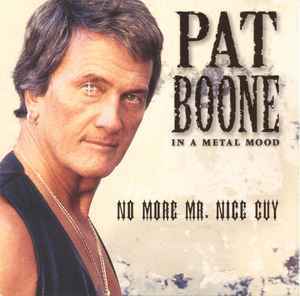 Also the fact Pat Boone is a hardline conservative Christian who, in 1997 recorded an album of heavy metal standards, big band style. Hardly endeared to his traditional audience (who were of similar right-wing political and religious views) and it got younger people laughing he'd even try this at all, basically, "what was he thinking?". Can you imagine your favorite hard rock and metal classics of the 1970s and '80s with big band arrangements? Most of the guitars in replaced by horns, although both Ritchie Blackmore and Dweezil Zappa do lend some guitar work. He croons those songs in a similar manner to Frank Sinatra and other pre-rock crooners from the WWII-era. No surprise that Pat Boone was kicked off his Christian TV program, thinking he fell victim to the "dark side". Amusingly, he appeared on the 1997 American Music Awards with Alice Cooper. Pat Boone appeared in leather and Alice Cooper (who you expect in leather) was giving him weird looks because we all know Pat Boone is way too square to be looking like that (he looks as convincing in biker leather and tattoos as Lawrence Welk tried looking like a hippie on one episode of his show). Ironically, both Alice Cooper and Pat Boone were born-again Christians. I first heard about this in 1999, a couple years after it was release. I was seeing this on television, can't remember where, what program I was seeing, but here I was, seeing Pat Boone singing "Smoke on the Water" with a big band brass section. I ended up mentioning my mother's friend at the time about it and she was in total disbelief, when I described it to her (after all she did like Deep Purple). Since that time, I mentioned this to many different people. Some gave me a blank look, they probably never heard of Pat Boone, even if they know these songs by heart, and others were fully aware of it. Some thought it was terrible, others saw it for the joke it was. Obviously, you'll probably just want to listen to this for a laugh, then stash it.